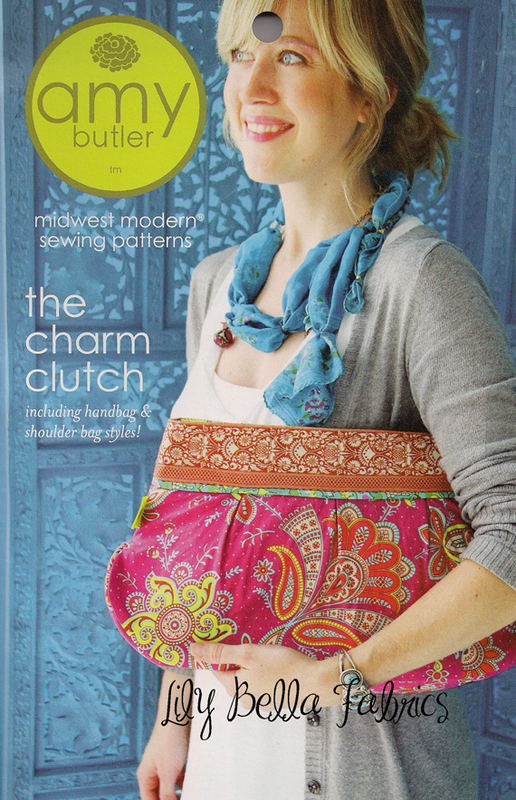 Amy Butler's Charm Clutch sewing pattern: includes instructions and pattern pieces for both handbag and shoulder bag styles. This elegantly proportioned charming clutch or bag transitions from casual day to dressy night (and holds everything you need!). Easily customize the Charm bag with 2 different length handles, different options for closures, and lots of fabric ideas. With interior cell phone and large pockets you'll keep everything well within Charms reach! The yardage given is for a one-way design. Allow extra yardage for matching or centering a design on your fabric. 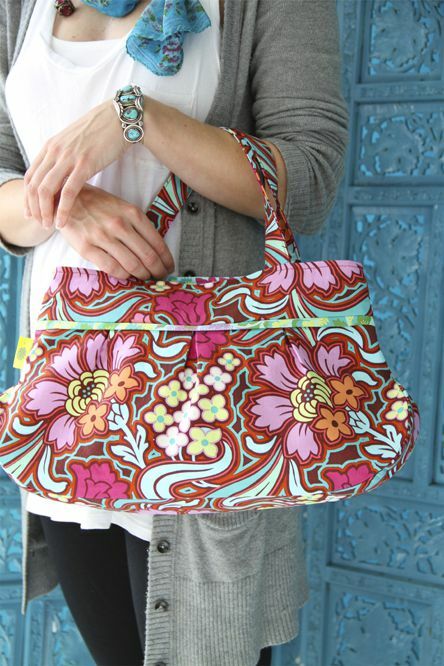 You can change the look of your bag depending on how many prints you use for your exterior. 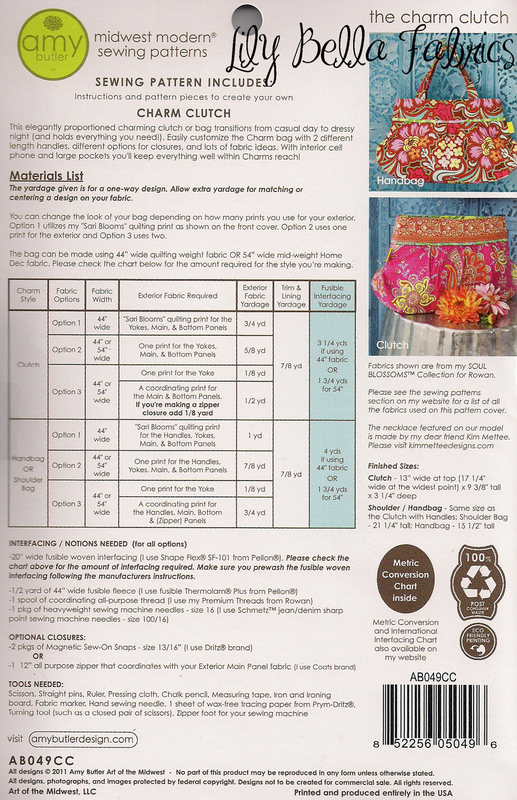 Option 1 utilizes my "Sari Blooms" quilting print as shown on the front cover. Option 2 uses one print for the exterior and Option 3 uses two. 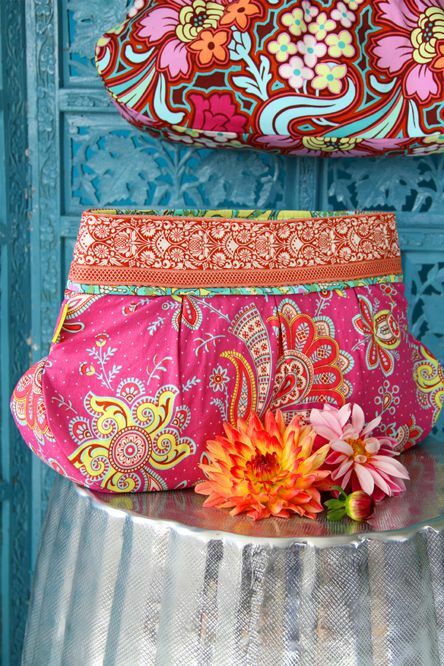 The bag can be made using 44” wide quilting weight fabric OR 54” wide mid-weight Home Dec fabric. Please check the chart below for the amount required for the style you’re making. 20” wide fusible woven interfacing (I use Shape Flex® SF-101 from Pellon®). Please check the chart above for the amount of interfacing required. Make sure you prewash the fusible woven interfacing following the manufacturers instructions. Due to copyright restrictions, we are unable to accept returns on patterns.